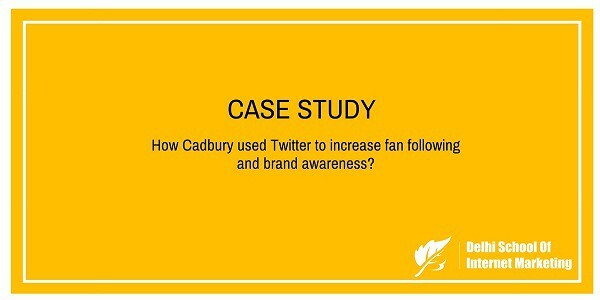 Case Study:How Cadbury used Twitter to increase fan following and brand awareness? Home > Blog > Blog > Case Study:How Cadbury used Twitter to increase fan following and brand awareness? Cadbury is a British multi-national confectionery subsidiary company completely owned by American company Mondelez International since 2012. It is the second largest confectionery brand in the world after Wrigley’s. Cadbury is headquartered in London and operates in more than 50 countries worldwide. It is famous for its Dairy Milk chocolate, the Creme Egg and Roses selection box, and many other confectionery products. Cadbury used its various social media platforms effectively to increase its brand awareness and engagement with Twitter at rank #1. Cadbury functions with a number of Twitter accounts, some for different countries that they have markets in like @CadburyUK, @CadburyCanada, @CadburyMY and also one specifically for their tourist attraction @CadburyWorld (35K followers). Their highest number of followers is on their @CadburyUK pagewith more than 282k followers. Twitter UK posts very light hearted and relevant content to showcase the brand image with comedy playing a central role in their strategy. They keep things fun with quirky stop-motion style videos and humorous graphics. A lot of their recent content has been tying in with their ongoing campaign #FreeTheJoy, which was launched in January 2014 and aims to bring ordinary people moments of joy. As part of the campaign, they have been sharing funny videos of people dancing and enjoying themselves every Friday to get people in the weekend spirit and to share a moment of joy with their followers. 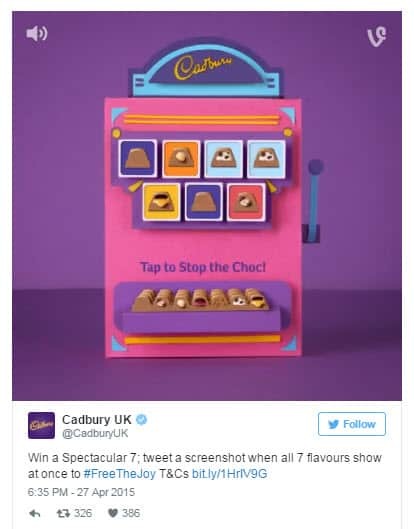 Regular competitions are held across their social media channels to win Cadbury’s products and tickets to Cadbury World, which is a great way of engaging their followers and encourage users to contribute their own content. Cadbury’s have developed a series of their own hashtags that tie in with their running campaigns and frequent content – for example #FreeTheJoy, which was altered to #UnwrapJoy around the Christmas period and #JoyCabs, which took place in February and involved dishing out chocolate prizes to those who took a picture of one of their Cadbury’s Joy Cabs. Cadbury run regular competitions through Twitter to win their products, both in the form of interactive games embedded into a tweet like the fruit machine style Vine below and those encouraging users to contribute their own photographs in order to win prizes, such as the #JoyCabs campaign. Both methods have received a lot of engagement from followers and are a great way to build loyalty among fans of the brand, as well as attracting new consumers. 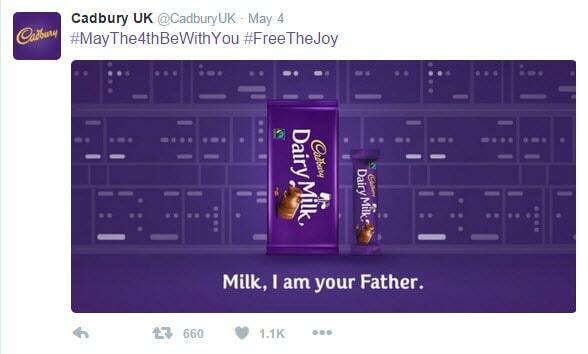 Cadbury is pretty good on its social media platform including Twitter. Regular posts over Twitter keeps the customers engaged over the platform. Though there is a lot of duplicated content across platforms and pages, this is understandable and it broadens the reach to different audiences. Cadbury’s main strengthis the power of engaging their fans over social media, as they are really good at answering to the comments and enquiries raised from customers.This positive value of the company really helps them in building a friendly and accepting brand image. The main corporate account has more than 282,000 followers, far more than any of the product-specific feeds, and tweets upwards of 20 times per day. A campaign to promote the new Wispa Gold using Promoted Trends increased ‘positive’ brand mentions on the social network by 1,800%.Furthermore, the ‘Retweet for Sweets’ challenge associated with this has seen engagement levels of 25%. [su_box title=”More Case study from DSIM:-” box_color=”#c7c7c7″ title_color=”#000000″ radius=”5″]1) How Sulekha.com lost its market leader position with the emergence of new movers in the segment like Olx and Quikr and how they plan a comeback? 2) How Happily Unmarried is making the youth of India happy with its quirky products?